Youth are the future of the country; they have the potential to design a better society. They are also considered as wealth and strength of any nation. They are the powerhouse and storehouse with infinite energy. Therefore if any country wants to make their future bright they should focus on their youth, they should strengthen and empowered their youth. The best way to empowered and strengthen youth is to provide them with a better education. Good and proper education make person scientific, logical, open-minded, responsible, honest and patriotic. All these qualities make the person walk on a rightful path and make them remain in a deep slumber of complacency. To focus of the youth and to pay attention on the vital role a youth can play UNO have proclaimed the year 1985 as the year of ‘INTERNATIONAL YOUTH DAY’ The symbol adopted by UN for this purpose is — A stylized facial profile of 3 youths against a dove in flight, with an olive branch alongside. 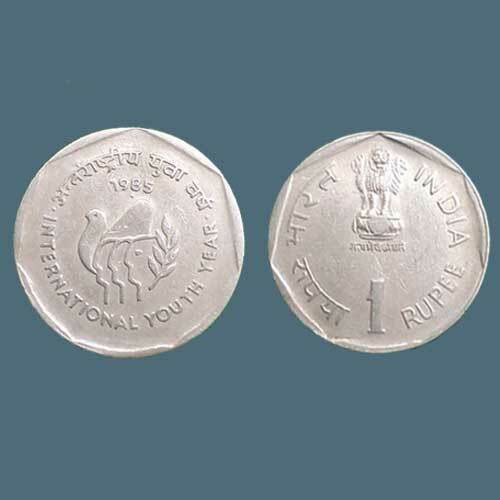 The Government of India had also issued 1 Rupee Commemorative coin with the theme of ‘INTERNATIONAL YOUTH DAY’ in the year 1985. They have also issued commemorative coin with the Rupees 100 denomination in proof and uncirculated specimen.